To call Garmarna "a Swedish folk band", or even "a Swedish folk-rock" band, is to be guilty of a terrible oversimplification. Yes, they play traditional Swedish songs and tunes. And, no question: they definitely rock. But for almost a decade now, Garmarna have been one of the most dynamic and innovative forces in-well, anywhere, and certainly in the Scandinavian "modern folk" scene with which they are most commonly and easily associated. Their albums have "developed" more than they have "progressed". The stark acoustic stylings that characterized their early sound have never left, but have slowly been joined by heavy rock vibes, shamanic electronica, and slamming techno beats to create a whole landscape of sound filled with wolves, snow, and evil spells. You can try to distinguish where the hurdy-gurdy stops and the spacey synthesizers begin, but for Garmarna, both have an equal place in their music, both are deep-rooted and forward-thinking. Predicting Garmarna's evolution has always been impossible, a truth which continues to be proven by their latest album, Hildegard von Bingen. Critics who thought they were familiar with Garmarna's gothic images of medieval Sweden clearly expected that a collection of songs composed by the twelfth-century German female mystic who lent her name to the album would be more of the same. Of course, they were wrong. There is a world of difference between the liturgical plainchants composed by the visionary abbess of a convent on the Rhine and fiddle tunes from a farmer's hut in Jämtland-even if we imagine both to be living in the same century. Yet in working with the material written by their nine-hundred-year-old collaborator, Garmarna have clearly found the means to bridge that gap as well as the inspiration to continue their own musical experimentation. There has, perhaps, never been a record quite like Garmarna's Hildegard von Bingen, and if there ever is another, it won't be made by Garmarna-they will already be working on something new. Whatever that is, all we know for certain is that it will be fascinating, virtuosic, and very, very cool. 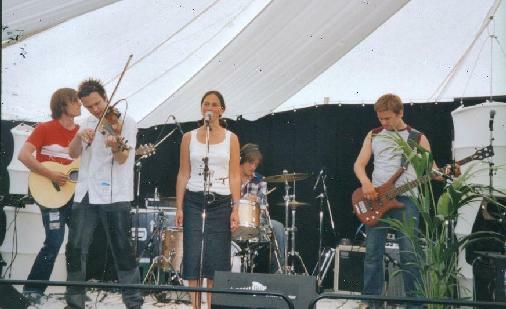 Scott Heller caught up with some of Garmarna's members after the bands triumphant set at the 2001 Roskilde Festival in Denmark (recordings of which have since been broadcast on Swedish radio) to find out all about working with Hildegard, and more besides. Scott Heller (SH): Let me ask you a couple of questions about the new CD. Where did you first read or hear about this mystical woman, Hildegard von Bingen? Is she someone you read about in school in Sweden? EH: It was a request, actually. It was some kind of local promoter for music in the county where we live, in Sundsvall, and they wanted to do a tour with her music and they thought that it would fit us to play the music. So they asked us if we wanted to do it. I had never heard of her before that. RW: I think none of us had. EH: Other groups that had made her music. SH: Groups who had put music to her words? EH: The song lines are hers, but not the things around it. RW: Not the arrangements. So what we did, basically, was to arrange what we normally do but to her music, which was hard enough. It was... kind of impossible, actually. GR: It took a while. EH: It was really hard. RW: I think we learned quite a lot from it. SH: Did it force you to rehearse more than normally to get it together? RW: If you weren't unaware, you wouldn't have done it, I think! If you knew what was going to happen. EH: Yeah, I wouldn't have done it myself, listening to her music, and said, "Oh, I want to learn this." I would just have thought, "No, this is too hard!" (laughs) But now I had to, so it was really good for me. SH: In the Garmarna newsletter, you mentioned that there were very mixed reviews of this album. One thing my wife and I both noticed was a difference in the way the percussion was used on this album, in that the sound is less traditional and more programmed or electronic. Was this in order to fit the types of arrangements you were creating? GR: He [producer Eric S] is also a genius when it comes to programming drums. He is extremely good! RW: He is great doing that. And also, it's kind of a step... Even though it is a project that we won't be dealing with so much in the future, it is also a step ahead. Now we know that we can do it, and it kind of points out a kind of direction where to go in the future. SH: I think with bands that play this folk-rock type music who try to step more toward a techno or electronic direction, some have had very good success with it, but I think for some of them it hasn't worked so well. For instance, I didn't think Hedningarna's remix project CD didn't work at all. RW: I think it depends on what people you work with, how much you trust them, you know? And that you also know what you want to do, sort of-to have an idea, even though it's not fair to you when you do it. But we have been playing this material for two years almost when we recorded the album... or at least a year and a half, or something. Then you know what it takes, or what you can do to the music. I think you're in danger when you start trying to push limits just to push limits. "Oh, let's do a remix album," because you want to do a remix album, not because you really want to do it-not because your music can take it, if you understand what I mean. But it's kind of funny when you mention the bad reviews in Sweden-or the or mixed reviews-because that's what we thought before the album as well, actually; that in Sweden it would be more difficult-or in Scandinavia-and then outside of Scandinavia, people will love it! (laughs) Because they aren't as prejudiced as the Swedish audiences or the Scandinavian audiences. And in most of the reviews, the critics have written... I think they didn't like it. They kind of... Well, it just doesn't have the same feel as the previous albums. But why should you make the same album twice? SH: You never have, actually. All of your previous full-length albums are very different. RW: Yeah, we like it, anyway! SH: Would you say outside of Sweden you are most popular in the U.S. or Germany? RW: Or maybe the U.S., I don't know. GR: It is hard to say because are not in any way big in these countries. EH: But we have a lot of fans. GR: But we have an audience in Germany and in the States as well-especially in Minneapolis. I think our biggest fan base is in Minneapolis because we have played there, like, seven times or something. EH: I guess it is also because the record company [Northside] is in Minneapolis. GR: Yeah, of course. So we have played there seven times. Last time it was sold out! RW: I think it has been sold out, like, the last five times or something! GR: Yeah. Otherwise... it's Germany. It was a long time ago that we played in Germany. RW: But I think it [a German tour] is planned for the Spring. EH: Yeah, that's what I say to them! Without knowing anything! SH: How many concerts a year do you play on average? GR: Last year, like five . Well, it depends on... if you get a record out, you play more. I think the most we have played in one year was, like, seventy concerts. RW: Well, also, it's kind of difficult because we are in some ways, I think, a little bit focused on the international scene. This summer we played more outside of Sweden, I think, than at home. SH: Have you done tours in Sweden where you play all the small towns like Luleå, Umeå, Skelefteå, etc.? RW: When we started this band, like, ten years ago, then you could still do that. But the live scene in Sweden has kind of changed-or actually disappeared-because then you could go and tour in the fall and in the spring, but not around Christmas and New Year. But nowadays, since you have all these festivals going on everywhere during the summer, you don't really tour Sweden nowadays. GR: Every town with any self-respect has their own festival. But I guess, like, eighty percent of it doesn't come around in terms of money. So all the clubs in those towns have no money left when the fall comes. RW: So that's kind of sad. GR: It's very hard to put together a tour, like club gigs or something. EH: But we never really have toured in Sweden. EH: We played in the weekends and stuff like that, but never like two weeks. RW: Yeah, I know, but I think it changed kind of around then. SH: It seems like it would be great to go around to Malmö, Göteborg, etc. and be in touch with your Swedish fans. EH: Yeah, that would be great, but it's so hard to make it. RW: I mean, the bands that tour Sweden now, they have a huge record company behind them usually-or at least a record company with plenty of money-and also a promoter with plenty of money, and they get sponsors and stuff. And then they, you know, send this band on tour for a month or whatever to promote the album. So the record company puts in plenty of money, and the band gets a couple of hundred thousand [Swedish kronor], you know, just to be able to tour. And we don't have that. We are on a very small label. Like, the smallest label on earth! It's a one man show. SH: Have you ever recorded any live shows for potential release or have any full-length concert videos been made? EH: It's hard to make it sound good. GR: It's hard to make is sound good. GR: We have been recorded for Swedish radio, for example, a couple of times, and it's like, "Ehhh..." It feels and sounds much better when you are on stage and through a PA.
EH: And the instruments sound so thin, in a way, because they are live. SH: You could get a very high quality audience recording and release something like that. GR: Yeah, I think the thing is, if you put some effort in it, it would be very good, I think. RW: We have a good one from Estonia though! We have a good live recording from Estonia, but it's all distorted-slightly-the whole show through... which kind of captures the spirit of Garmarna! GR: Everyone who puts out a live record today, they kind of mend it afterwards in the studio. GR: So, we could do that. RW: But, I mean, what's the point of doing it? How often do you buy a live recording? GR: But maybe you could, instead of that. I mean, now we have made so many records, sometime we have to do a "Best of"! But instead of that, we could have a kind of "best of concert" sort of thing recorded. RW: Yeah, "best of live". EH: Yeah, maybe. Maybe this one [from the Roskilde festival] will be on it. You never know. RW: Yeah! (laughs) You never know, actually. It takes some time, and it's an effort, you know, to do it, and we are kind of a lazy band. We never rehearse and all that! EH: (laughs) We just want to play live. We don't want to rehearse. SH: Well, if you play live enough, you don't have to rehearse. You can work on new songs while you tour. RW: I think that's true, actually. I think you learn more from playing live once than rehearsing a week. That's where all the bits and pieces come together... whether it works or not. SH: Do you usually compose more music in the winter time? EH: Ask Stefan. He is the one who is the music maker. [Stefan is sitting at the other table, about 8 feet away] I only make music when I am forced to. RW: Stefan! Skriver du låtar på vintern eller sommaren? SH: So you are making music all the time? SB: Well, it sounds different between winter and summer, in a way. SH: I think in the wintertime in Scandinavia people tend to be more locked up inside. But in the summertime everyone's out in the parks having parties. The musicians I know are spending less time making less music in the summer because the weather's good and they're hanging out with their friends. SB: On the other hand, you feel more energized in summertime. So it's easier to actually do something. So... I don't know, strictly. I haven't thought about it! SH: How often do you guys get together and sit around and listen to music? GR: In the bus, when we are touring. When we travel to gigs. EH: Yeah, we listen to music all the time when we travel. But some of us live in Sundsvall and some live... we don't live in the same place, so... I guess if we lived in the same town it would be a lot easier. RW: But also, I mean, after ten years we know each other quite well. So it's like family. (laughs) If we've been touring for a while then, personally, when I get back home, I wouldn't want to see their faces! (laughs) You want to meet some other people. But then, after a couple of days, it happens quite often that you phone someone-just, you know, to talk a bit-and then it kind of wears off and you are back to normal again. SH: It sounds like you spent a lot of time putting the Hildegard von Bingen album together. RW: Actually, basically, it was Stefan's project, mostly. He did most of the work. EH: The CD, yes, but when we worked with the music, that was three years ago, when we worked on thing, because we were going to do this tour. Then we were working a lot. EH: Together. But then when it came to do the CD, it was like Stefan's. He was the engine of it. EH: So in one way, it's really... without him, this CD wouldn't be here. SH: Has there been anything special planned by the people who motivated you to do this project, like a "Hildegard von Bingen Day", where you play the whole thing with visuals, and stories about Hildegard, and that type of thing? EH: Reading the lyrics in some kind of poetic way, talking about Hildegard von Bingen. So that whole concert was, like... there was no applause between the songs because she was talking and we played it in churches. So it was a bit like that. GR: It was like one piece, the whole concert. SH: Where were those concerts? EH: In the county where Sundsvall is. In the Churches there. GR: It was really great. EH: Yeah, we should do something like that again, I think. RW: We did a few of them in the U.S. in November. O.K., one. EH: Yeah, but not with any narration. GR: It was funny-when they [the promoters] asked us the first time, they had this idea, "Well, maybe we should have dancers in medieval clothes-and maybe you should have medieval clothes." And we were like, "No. If we're going to do this, we want to do it our way." SH: Well, I can tell you guys are pretty causal people and not dressed up for the rock-star thing. RW: That has been kind of important for us all the way through, I think. We do it our way. That's basically the whole idea with playing Garmarna's music. I think. That is why it's fun. SH: Since the Hildegard von Bingen project was started several years ago, is there already new music composed for a new Garmarna CD? RW: No idea! (laughs) Stefan, har du gjorde låtar för nästa platta? EH: Actually, now, it feels like we haven't had any-at least, I haven't had any-energy to search for any new material for Garmarna while we've been working with Hildegard von Bingen. And I have been working a lot with my other band, as well. But now! Now, it starts like it feels like, "O.K., it's time to search for some new lyrics and stuff." But we at least, I haven't had the energy to do it! SH: Talking about the techno stuff again-have people approached you to remix Garmarna songs? RW: I don't know! I should... [Richard speaks to Stefan again.] Actually, a few people have done remixes, but I haven't heard anything of it, I think. SH: Has any of it been released? SB: Yes, in the US. EH: Oh! I didn't know that! SH: I would like to have a list, just to know who these people are. SB: Me too! Actually, I don't know if it happened. But I know there was a team of remixers, actually. They phoned the record company in the U.S. asking for permission to put it out on a collection CD for radio stations. I don't know if it actually happened, but I think so. But it was really serious. There is also a wonderful remix of "Euchari" that was never put out. It's by a pop duo of producers in Sundsvall. It's really good. RW: I have heard that, but I had forgotten about it. It's from Vedergällningen. EH: Maybe I have. I don't remember. SH: Do you know the Danish band Sorten Muld? EH: I liked their first. Have they made one CD? SH: Yeah. they have three CDs. The first one that they did themselves, and now two on Sony. EH: Oh, I've only heard one of them. RW: I've heard the first album. I think it's very good. EH: Yeah, me too. I like that one as well. RW: But I think … Haven't we met them sometime? EH: Yeah, we met the bagpipe player, didn't we? RW: Yeah, he is quite nice. But, you know, we don't know very much about folk music. Obviously, Emma does, and Stefan does, and we meet all these people, but... at least, I don't listen to folk music much. SH: What kind of music are you currently listening to? RW: Currently, it's... I don't know. I got the Manu Chao album. SH: I have not heard it. RW: He is playing tonight at seven o'clock. You should see it. That's great. And [about music currently listened to] I don't know really. It's mixed. EH: For me, if I listen to folk music, I listen to the traditional music. I don't so often listen to the mixed... well, I listen to that first CD of Sorten Muld. SH: Is there a huge untapped pool of ancient Swedish literature that you will be able to get ideas from for songs? EH: Yeah, there is a lot. I mean, it's very big. EH: Yeah, I mean, we have only been using so... jag kan inte prata! SH: A tiny amount of the available material? RW: But also, like, perhaps eighty or ninety percent of that is very similar lyrics as well for them. EH: Yeah, it's hard. That's true. RW: And you really have to look for material which is different, which is something that attracts your attention. And that's kind of hard, you know, trying to find... I don't know! [To Emma] You do all the work, so I shouldn't say. EH: It's really hard to find. You can go to the archive in Stockholm where they have every recording of old people that they went out an recorded in the sixties and forties. And they have notes, as well. But when you sit there for one week, and you listen to all these tapes all day, all day, all day for one week, then you can listen to so much but you can maybe sometimes only find one tune. So it's really hard to just find that one that you think, "Oh, this is one for us." Well, that was it. As Carl said in the introduction, Garmarna are a band that each and every release is different. For the Space Rock crowd I would recommed their CD, Verdergällningen from 1998. Check out their web page for all the latest information at: http://www.cabal.se/massproduktion/garmarna/.